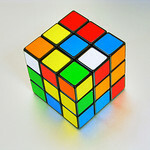 Home > Uncategorized > Happy Birthday to the Rubik’s Cube! Happy Birthday to the Rubik’s Cube! Today we are celebrating the 40th anniversary of Erno Rubik inventing the Rubik’s Cube by making todays “Google Doodle” a working Rubik’s Rubik’s Cube is a 3-D combination puzzle invented in 1974 by Hungarian sculptor and professor of architecture Ernő Rubik. Can you solve the Rubik’s cube online? Originally called the Magic Cube,the puzzle was licensed by Rubik to be sold by Ideal Toy Corp. in 1980 via German businessman Tibor Laczi and Seven Towns founder Tom Kremer, and won the German Game of the Year special award for Best Puzzle that year. As of January 2009, 350 million cubes had been sold worldwide making it the world’s top-selling puzzle game. It is widely considered to be the world’s best-selling toy. In a classic Rubik’s Cube, each of the six faces is covered by nine stickers, each of one of six solid colours (white, red, blue, orange, green, and yellow; in currently sold models, white is opposite yellow, blue is opposite green, and orange is opposite red, and the red, white and blue are arranged in that order in a clockwise arrangement). An internal pivot mechanism enables each face to turn independently, thus mixing up the colours. For the puzzle to be solved, each face must be returned to consisting of one colour. Similar puzzles have now been produced with various numbers of sides, dimensions, and stickers, not all of them by Rubik. Although the Rubik’s Cube reached its height of mainstream popularity in the 1980s, it is still widely known and used. Many speedcubers continue to practice it and other twisty puzzles and compete for the fastest times in various categories. Since 2003, The World Cube Association, the Rubik’s Cube’s international governing body, has organized competitions and kept the official world records.